Program, portfolio and PMO managers understand the ‘benefits to value’ of a project and can use ROI (return on investment), IRR (internal rate of return), or other financial metrics, as well as non-financial criteria (‘intrinsic value’ criteria) to evaluate projects at the start of and during their full lifecycle into ‘operations mode’. Selecting which projects to charter within your organisation has long-term implications both for you individually and your organisation. Conducting in-depth pro-forma ROI, IRR or other financial analysis can be costly and time consuming. What about an alternative method that is relatively quick and easy to undertake and can provide you with an objective ‘weighting’ criteria for your stakeholders and program/project team to consider? If you manage a PMO, portfolio or program of work, the Customer Demand Priority (CDP) tool we put forward below may be helpful to you at the front-end decision-making process of project prioritisation. It is a simple method that is similar to a risk matrix table to evaluate and score projects on a scale from 2 to 11 where 2 is the lowest challenge and 11 is the most intensive. The ‘CE’ or ‘Customer Demand Priority’ is based on the total of Customer Impact (CI) and Technical Severity (TS) whereas CE equals the CI Factor plus the TS Factor with a possible value range of 2 to 11. 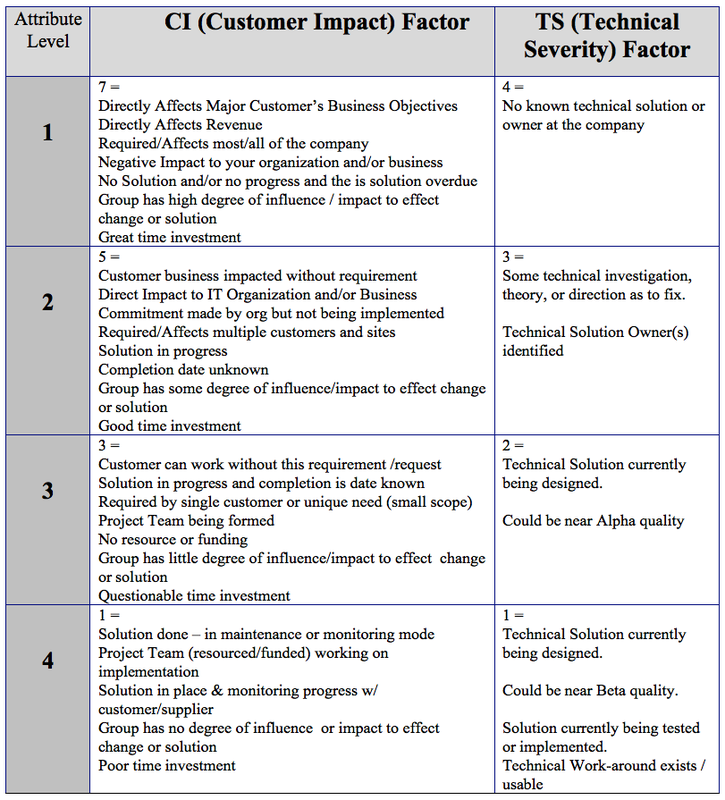 Similar to risk management or project ‘stoplight’ values, the scores of 8 to 11 are high impact, 5 to 7 is medium impact, and 2 to 4 is low impact and the tables below give the suggested actions. Looking at the table below, you will see the scoring matrix and suggested actions. The customer challenges are weighted on a score of 7, 5, 3, and 1 and the technical challenges on a score of 4, 3, 2, and 1 with the philosophy that proper engagement and agreement with the customer (or people issues) are slightly more challenging that the technical hurdles. Also, we hope providing an empirical number weighting to a project removes a lot of the ambiguity that can otherwise exist. Additionally, the weighting can be used for inclusion in assigning staffing and other resources. Theoretically, three #3 and one #2 project equal in ‘value’ to one #11 and therefore a project manager assigned to four projects of that weighting has the same amount of workload as a project manager with one #11 project. This may not be exactly true, and can be offset by the quality of the original evaluation criteria, but does provide some ‘guideline’ to use. If you manage a PMO, then this may be a simple means of first evaluation of your projects and assignment of project managers. Here’s an example of how it works. Take a look at the attribute weighting factors in the table below. You will notice that the higher scoring boxes have a much more intensive criterion than the boxes below. The key to the successful use of the matrix is for the team and stakeholders to agree on a set use of criteria for inclusion in the matrix, which directly reflects on the mission of the group. Even though the CE tool uses a Technical Severity rating, this does not limit it to evaluation of IT projects. Consider for a moment the rational for the two measures. The CI is a measurement of the impact to the customer. TS, while it is named Technical Severity, is a measurement of difficulty the project would be to execute. The TS can easily be adopted to fit any type of project. Once the CI and TS criterion are developed, they should be reviewed and approved by your stakeholders. In today’s marketplace, resources are limited and must be allocated to projects that have the highest chance of return. Equally, we are all pushed for time and we are not always in a position to conduct detailed financial metrics analysis. 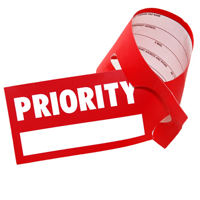 The Customer Demand Priority tool may be a helpful alternative for PMO, program and portfolio managers to use at the front-end decision-making process of project prioritisation. Once the criterion is determined then all projects can be reviewed, weighted, and expectations to implement can be determined accordingly.